 Can evolutionary theory predict which strains of fly, AIDS, and West Nile virus will be most deadly next year?  What new forms of life will researchers discover?  What will the study of fossils and genes reveal about the early evolution of plants and animals? Flu Evolution Modeled This report, from Nature Science Update, describes a new mathematical model of flu evolution that may indeed help to predict which strains of the virus will be most deadly in the upcoming year. Be sure to check out this additional report on the same research, as well as this news release from Princeton University, where the work was done. Class Notes on Flu Evolution are available from a course at UCLA. HIV evolution Although science cannot yet predict the course of HIV evolution, it is now clear that the evolution of the virus plays an important role in AIDS. This link leads to a scientific paper on the subject. Purple Frog Pops Up Believe it or now, researchers have discovered a completely new species of frog. And it's purple. This article, from the Genome News Network, describes the frog and its characteristics. Important new Prehuman Fossil Discovered A new prehuman fossil discovered in the central African country of Chad indicates that human ancestors were more widely-distributed tha\n previously believed. 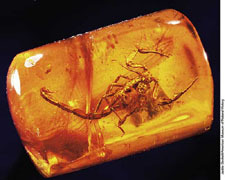 Other reports on this discovery are found at Nature Science Update and National Geographic News.